This project originated from a customer referral who learned about our problem-solving abilities. The researcher’s lab is located at the Centre de Recherche du Centre Hospitalier de l’Université Laval (CR-CHUL) in Québec city. They challenged us to amplify DNA sequences from confidential genomic DNA and from DNA plasmids containing other sequences of interest. Their goal was to assemble these 3 fragments by PCR overlap extension. The first challenge was to obtain specific bands by high-fidelity PCR. Then, assemble everything together by PCR overlap and extension. Note: we had to redesign some of their primers because one of them had 2 binding sites, thus the PCR amplification could not be specific. So the goal and strategy of the design for PCR overlap and extension is depicted in this image. 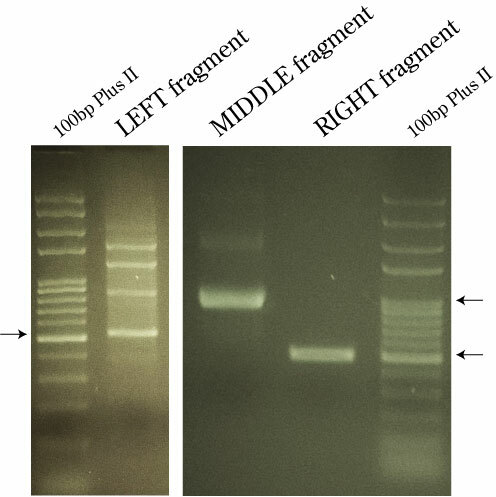 We have to produce 3 DNA fragments by high-fidelity PCR and join them together by high-fidelity PCR forward primer A and reverse primer F.
The AB fragment was amplified using TransStart KD Plus (Ultra-HiFi) DNA Polymerase. 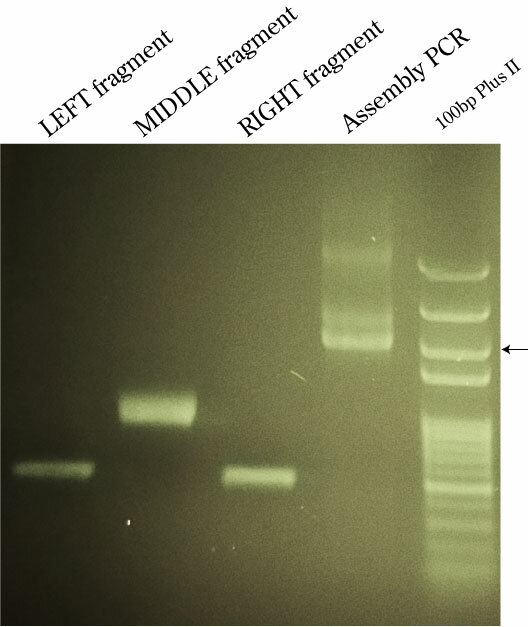 CD and EF fragment were amplified by PCR using TransStart FastPfu (High-Fielity) DNA Polymerase. The arrows point to the specific amplicons that were then extracted ad purified using the Favorprep GEL/PCR Purification Kit. 1 ul of purified LEFT, MIDDLE and RIGHT fragments were mixed with primer A and F in a standard FastPfu PCR reaction. The correct amplicon corresponding to the full assembly of LEFT-MIDDLE-RIGHT is shown by the arrow, along with the corresponding fragments. Likely due to the nature of fragment LEFT and MIDDLE fragments to multimerize, we can also see some non-desired bands above the fully assembled amplicon.